Jimson Weed. Datura stramonium L.
Jamestown weed, Jamestown lily, thorn apple, devil's apple, madapple, stinkweed, stinkwort, devil's-trumpet, fireweed, dewtry. This is a very common weed in fields and waste places almost everywhere in the United States except in the North and West. Jimson weed is an ill-smelling, poisonous plant with stout, much-branched, leafy stems from 2 to 5 feet high. The large, smooth, thin, wavy, toothed leaves are from 3 to 8 inches long. The flowers, which appear from May to September, are white, funnel-shaped, about 3 inches long, and have a pronounced odor. The prickly seed pods which follow are about the size of a horsechestnut. When ripe these pods burst open, scattering numerous poisonous black, kidney-shaped seeds. 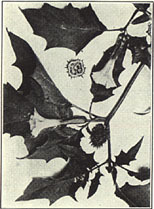 The leaves, collected when the plant is in flower, and the seeds. prev: Jack-In-The-Pulpit. Arisaema triphyllum (L.) Schott. next: Ladyslipper. (1) Cypripedium pubescens Willd. ; (2) C. parviflorum Salisb.